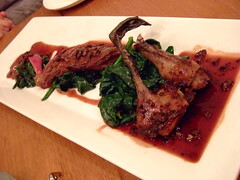 The photos are from two amazing dinner I had in this bistro specialised in “gibier”(game meat). 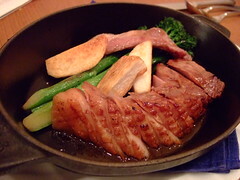 I’ll write the details later but the wild boar(“inoshishi”) is a must get. 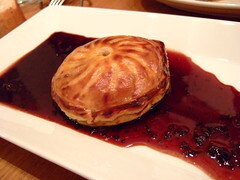 For me, gibier cuisine has been expensive and hit-and-miss experiences so far, but everything I had in this bistro was fantastic and it was inexpensive and every yen worth it. 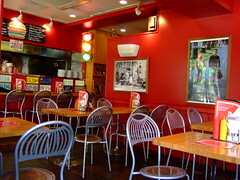 A hamburger shop near Ningyocho station in the Nihonbashi area. 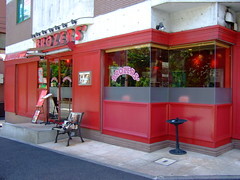 The shop is very famous but a couple of my friends told me that they went there with high expectations and were disappointed. 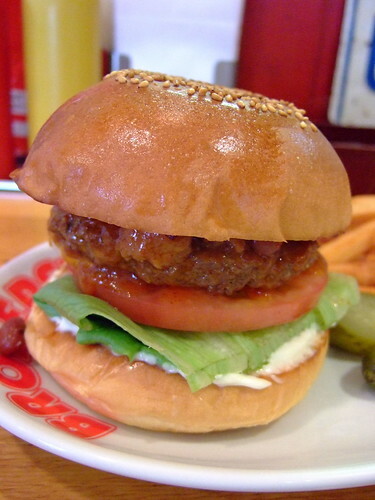 After trying for myself, I think the beef patty is not as juicy as I would like, but the burgers are still nice because other ingredients such as the veggy, different kinds of toppings, the sauces and the bread are well-prepared. 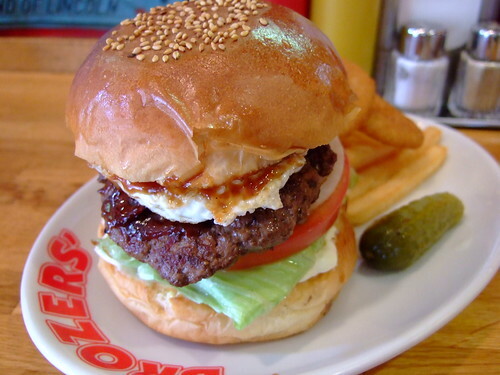 Also if you order the burger, it will come with very nice French Fries and 2 onion rings – I know it’s common in most countries but it’s not in Japan. 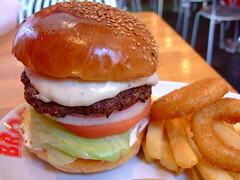 WED Chili beans Burger, Y1050. 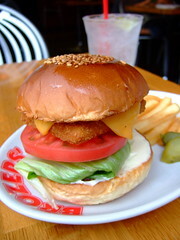 Red Hot Chili Burger, Y950. 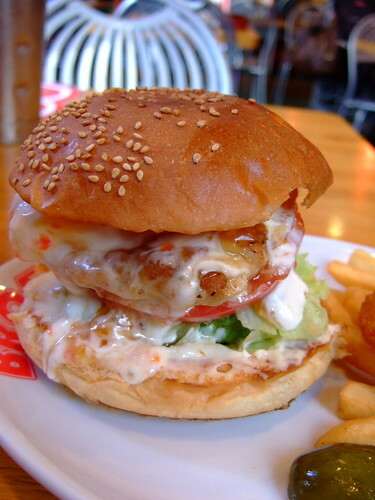 Sweet Chili Chicken Burger, Y1300. 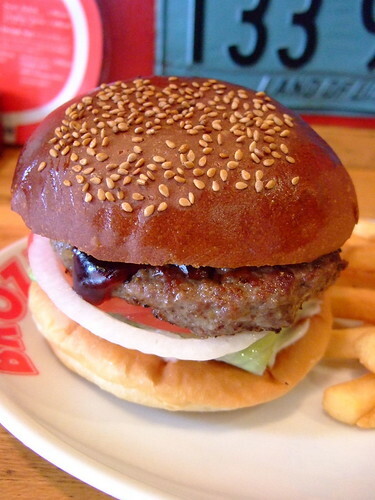 Lot Burger,Y1500. 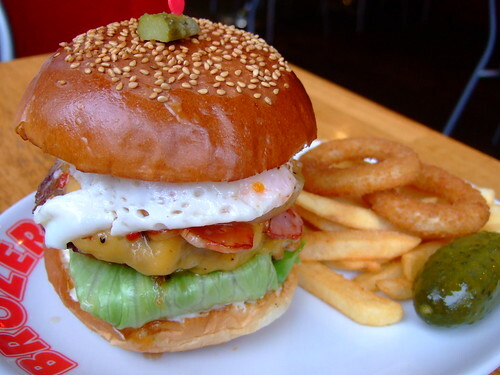 Toppings: Bacon, cheese, egg, pineapple. 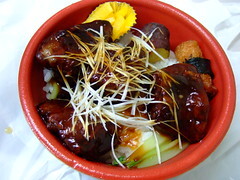 Sauces choose from: BBQ sauce, Teriyaki sauce, Red hot chili sauce, or Sweet chili sauce. 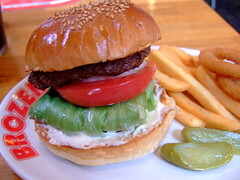 My favourites are Lot Burger, Avocado burger and Chicken Cheese Burger. 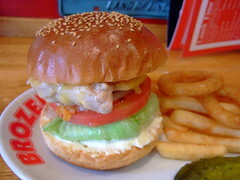 If you order the burger from the lunch menu(both “daily special” and the regular burgers), you can get the “hamburger drink set” for Y150. 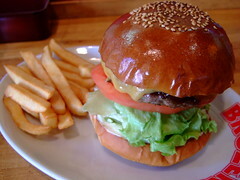 Everything in the Grand Menu is also available at lunch time but no drink set for that. 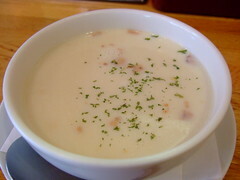 I’ve tried quite a few side menu, soups, desserts etc but I don’t really recommend them. 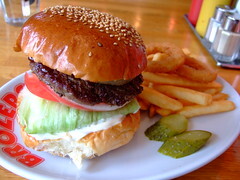 Stick to the burgers! Grand menu: 1, 2, 3, 4, 5, 6. 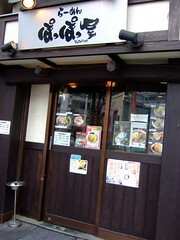 The owner of this ramen shop used to work in Jiro, which explains the resemblance to Jiro in taste and style. I’ve tried the Suidoubashi branch near Tokyo Dome(left pic) and the Nihonbashi honten(right pic) which is the original shop. 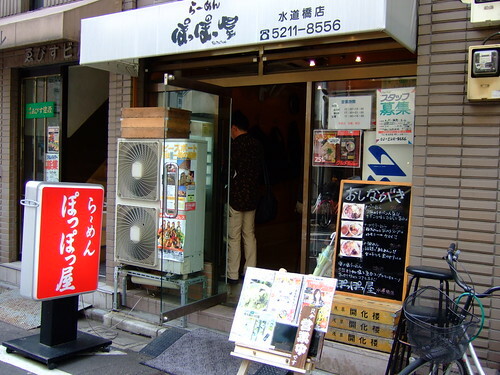 The two shops are similar in quality – Nihonbashi branch is a little bit more expensive(talking about ~30 yen difference), and Suidoubashi branch is less shabby and is easier to go in for female customers. 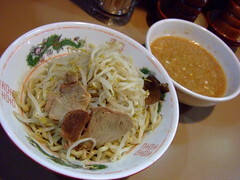 I really love the thick and chewy noodles here. 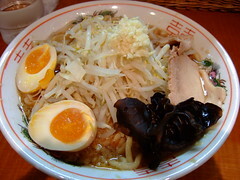 The soup is Tonkotsu(pork bone broth) and soy sauce based, which is nice but I find it too salty to drink on its own. 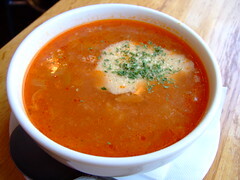 So rather then soup ramen, it’s more like ramen mixed with sauce. 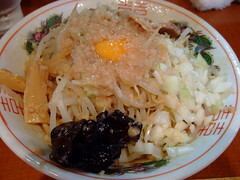 Just like Jiro, it’s free to ask for extra vegetable(mostly beansprouts), extra onion, extra pork fat, stronger taste, and garlic. In the following, left pic is from Suidoubashi, right pic is from Nihonbashi. 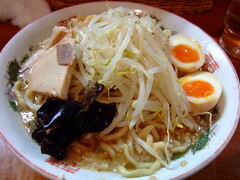 Umi no Shio(Sea Salt) Ramen, Y780. 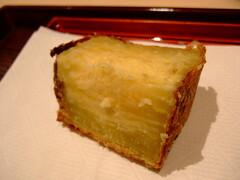 Ajitamago(boiled flavoured egg), Y100. 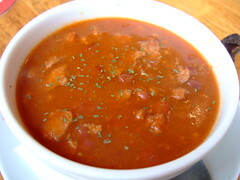 Aburamen(Y780) is the most popular item. 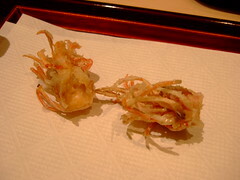 Left one has garlic topping. 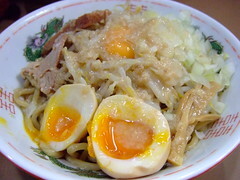 Right one has ajitamago topping(I didn’t know Aburamen would come with egg already!). 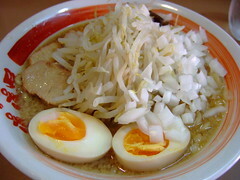 Regular Ramen, Y700. Ajitamago, Y100. 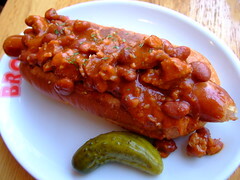 Left one has garlic topping. 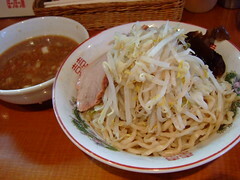 Tsukemen, Y780. 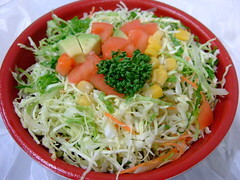 Left one has extra vegetable topping. 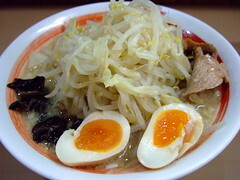 Chilled Salad Ramen, Y850. 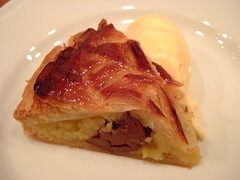 I only tried it in Suidoubashi branch, not sure if it is available in Nihonbashi. 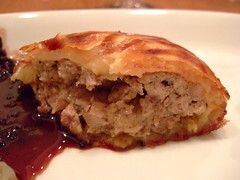 Pretty nice but gets a bit salty towards the end – too much dressing. 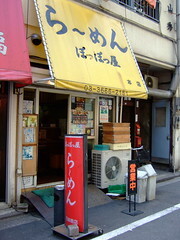 Right pic is a branch in Yushima(near Ueno park). I just walked past but didn’t try. 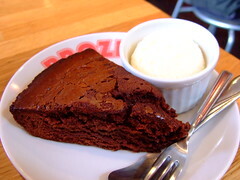 Suidoubashi Branch’s menu here and free topping menu here. 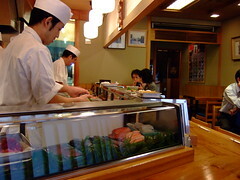 Nigiri-zushi(regular rank, large size), Y2310. 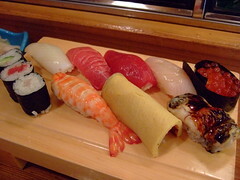 Nigiri-zushi(upper rank, regular size), Y2100. 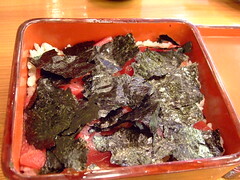 Chirashi-zushi(upper rank, large size), Y2310. 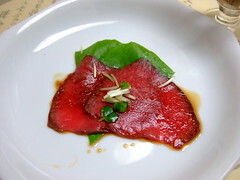 Tekkajuu(Maguro on sushi rice), Y2310. 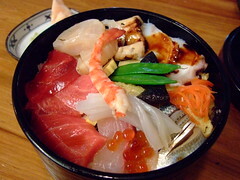 Chirashi-zushi(upper rank, regular size), Y2100. 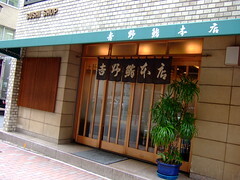 Pretty nice and fairly reasonably priced sushi place right behind Nihonbashi Takashimaya. 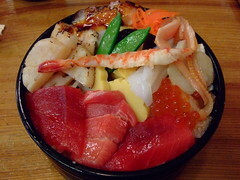 I really like the Chirashi-zushi here. 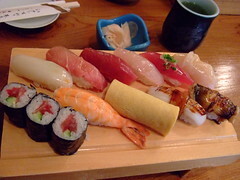 Nigiri set is also good. Don’t recommend the Tekkajuu though. 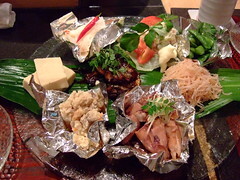 Sukiyaki lunch set A(3000yen + 10% service charge even at lunch time). 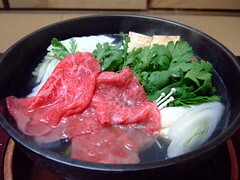 The cheapest Sukiyaki set in the menu and the meat is the lowest rank. 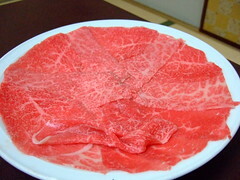 The meat is a mix of different parts(loin, thigh, filet etc.). 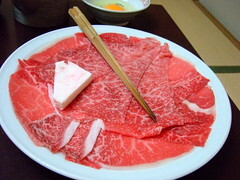 The staff spread the fat in the pan, added the warishita(soy sauce, sugar, mirin) immediately without grilling any meat, and before the warishita was brought to boil, added the first few slices of meat directly. 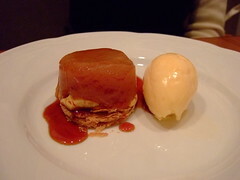 I thought the way she did it was a bit odd but I found out later that it is the style of this restaurant. 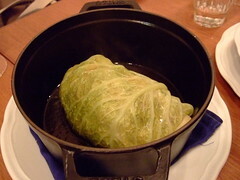 After that you can cook the rest of the beef yourself, and the staff will come back and check on you, help you cook the veggy etc. 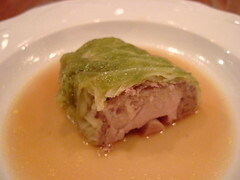 I found the warishita too salty and too sweet – apparently strong warishita is traditional Tokyo style for Sukiyaki. I had to order another bowl of rice because I couldn’t eat the meat on its own. Rice is not refillable but for some reason they decided not to charge me this time. 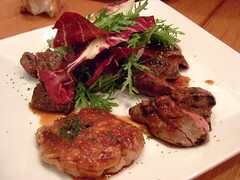 Beef filet cutlet lunch set(2700yen). 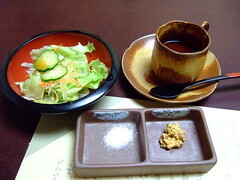 The set includes beef tataki, salad and ice-cream. 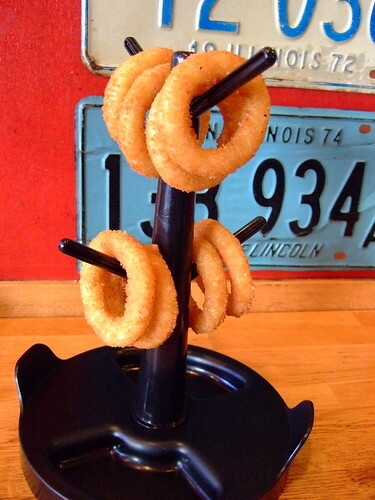 At first I thought the round thing was Calamari but it was actually onion ring. 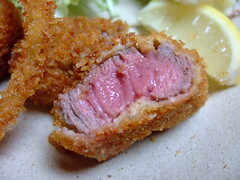 The beef was tender. 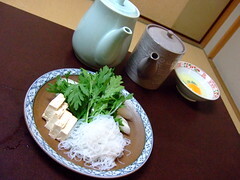 Shabu-shabu A set(3600yen). Also the lowest rank. They sell meat right next door and also do take-away bento which are quite cheap(compared to the price of the restaurant menu). 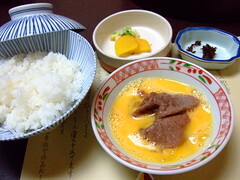 Kakuni-age Gohan(800yen). 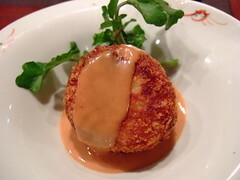 Fried pork in a sauce that is basically thickened warishita….the pork is nice but the sauce is again too salty+sweet for me. 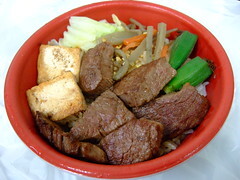 Beef filet steak Gohan(1000yen). 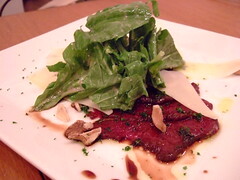 The beef is surprisingly good quality for the price. 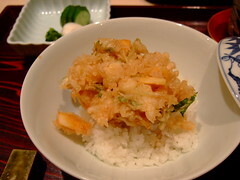 Though there are only a few pieces so you need some side dish to finish the rice, which is plenty. 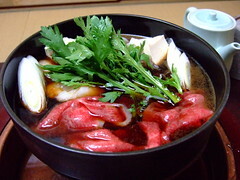 Gyu-nabe Gohan(900yen). 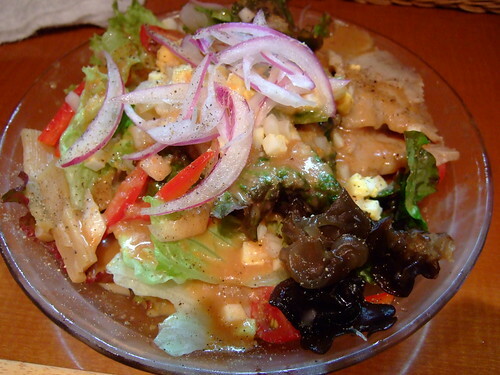 Basically sukiyaki on rice – it’s quite nice. 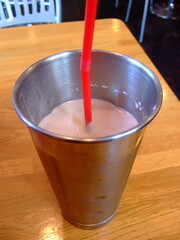 Not too strong-tasting. 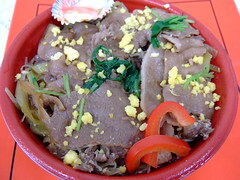 Yaki-buta Gohan. 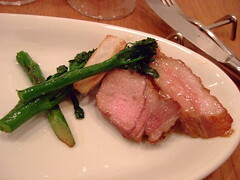 Under the salad is grilled pork(pic here). 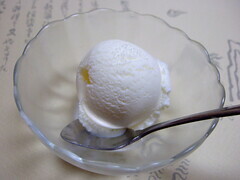 So-so. 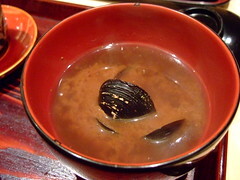 I haven’t visited that many Sukiyaki and Shabu-shabu restaurants so it is hard to judge but I think I prefer Imahan Banyou(see posts here) more than Isejuu. 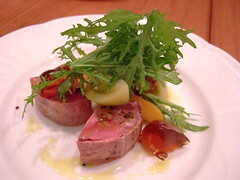 From 8400yen “Fuji” dinner course. 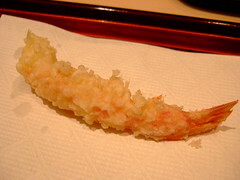 Prawn head. 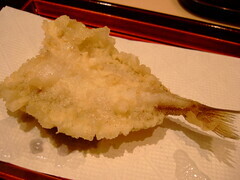 Kisu – white sillago fish. 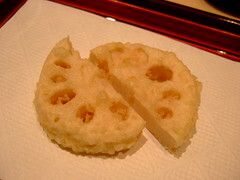 Renkon – lotus root. 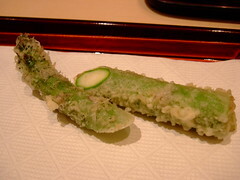 Anago. 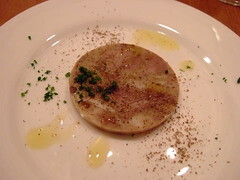 Satsumaimo taro(pic shows 1/4 cut) is not included in any of the courses but it is a MUST order. 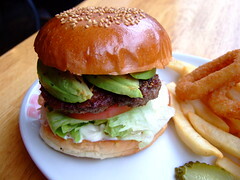 It takes a long time to make so you must order at the beginning. 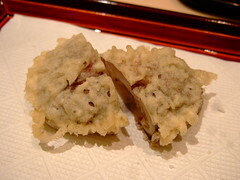 Kakiage(with lots of scallop) tendon. 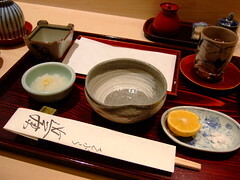 You can also choose chazuke with the kakiage, or have kakiage and rice come separately. 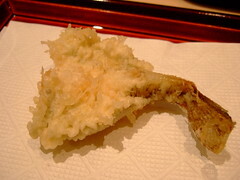 I wanted to try the sweet sauce so I opted for the tendon but to enjoy the crispiness, it is probably better to have it come on a separate plate. 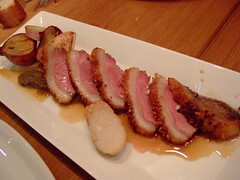 Kondo is so famous that I think every foodie interested in dining in Tokyo knows. 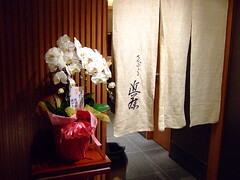 Somehow the idea of a 9F floor high-end restaurant in Ginza with only counter seats made me a little nervous before going, but to my surprise the atmosphere is totally casual and the staff are friendly. 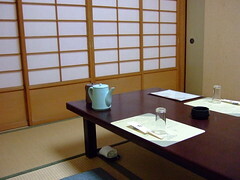 We sat in front of Kondo-san but there is a comfortable amount of space in between and he was busy making the food anyway so we were quite happy to be left alone. He cooks for other customers too and the younger chef also cooks for us so I guess it doesn’t really matter where you sit. 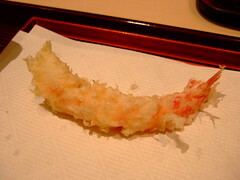 We had the cheapest course with 2 prawn, 3 fish and 4 veggy, which is actually quite enough. 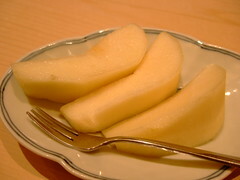 The ingredients are all top-notch and fresh that I ended up eating them with just salt and sudachi and didn’t want to “spoil” them by dipping into the sauce with grated raddish. 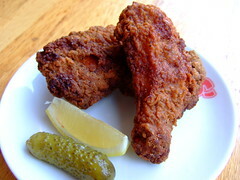 We were there for about 2 hours and as far as we could see, the oil(100% white sesame oil) was changed 3 times. I saw other customers ordering uni and shirako which looked so amazing that I couldn’t help drooling…too bad my friends were all too stuffed. 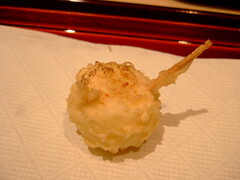 I haven’t been to that many high-end tempura places so I can’t say much but I totally enjoyed the meal in Kondo. 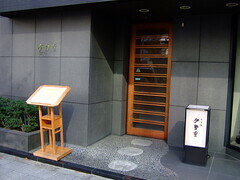 A very small restaurant offering casual Kyoto food with only one table and about 12 counter seats. 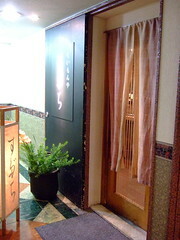 It is located on the third floor of a “multi-tenant building” near Shinbashi and Ginza. 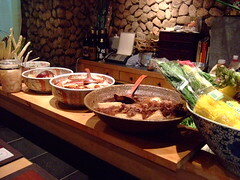 The Obanzai(Kyoto daily family dishes) lined up on the counter made me drool hungrily while waiting for my friends to arrive. Other customers all ordered from the a la carte but we decided to go for the 5000yen omakase(chef’s choice) dinner course and let the okami(madam chef who is from Kyoto apparently) decide for us. 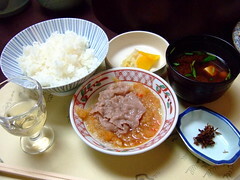 Obanzai moriawase(assorted): (anti-clockwise from bottom left)Unohara, squid, shirataki and mentaiko, cha-mame beans, potato salad, turnip, Koyadoufu, and marinated sanma in the middle. 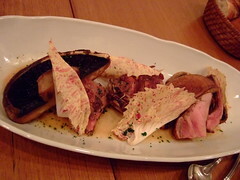 The picture shows portion for 3 people. 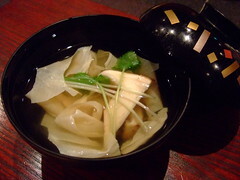 Clear soup with yuba(tofu skin) and matsutake mushroom. 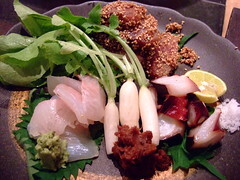 Sashimi(for 3 people): Hirame(bottom left), himedaikon(little radish, eat with miso), octopus(eat with sudachi and salt), Aji coated in sesame seed(at the back). 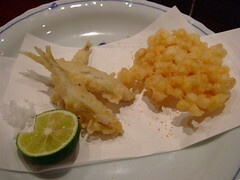 Wakasagi tempura and sweet corn kakiage(round fritter) in curry flavour. 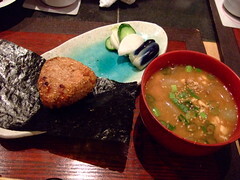 Grilled Onigiri(rice is flavoured) and Kenchinjiru(miso soup with root vegetables). 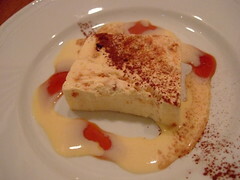 This is a side order not included in the course. 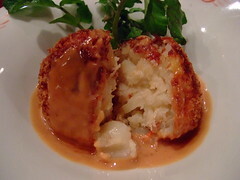 Deep-fried crab meat potato salad. 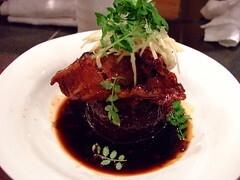 Buri daikon(Buri and radish simmerered in sweet soy sauce) is a side order also. 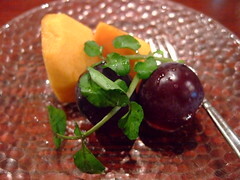 Dessert included in the course is fruit. 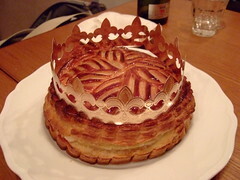 Everything is absolutely delicious. 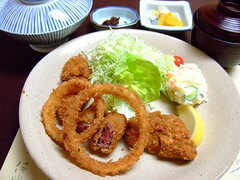 Kyoto food gives the impression of very mild and light taste but the food served here all had strong flavour, which I actually prefer. 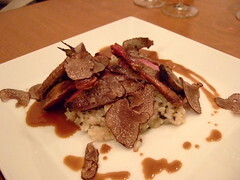 The ingredients used are of good quality and you can really tell the attention paid to the detail in making each dish. 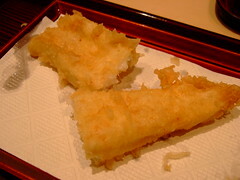 The obanzai is reheated before serving which is important for me to enjoy it fully. The madam chef behind the counter was working non-stop throughout the night but whenever she had a moment she would smile at us and ask if everything was alright, so even though we did have to wait quite a bit for each course, we didn’t really mind. 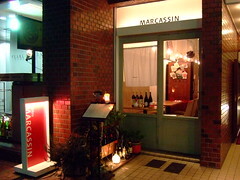 The restaurant is not non-smoking which is really a shame though…must remember to book the table away from the counter seats next time. 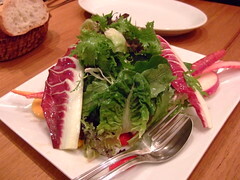 Including a drink, side order(which proved to be too much and we were all bursting-full at the end…), about 7000yen per person.